Besides Humans, The Only Mammal Known To Love Hot Peppers Is The? The Largest Sea Plane Ever Built Was The? With that in mind, it was understood only humans enjoyed torturing themselves with the dubious pleasure of lighting their mouths on fire with increasingly spicier peppers. But it turns out we’re not alone in the mammal family when it comes to avid pepper consumption though. 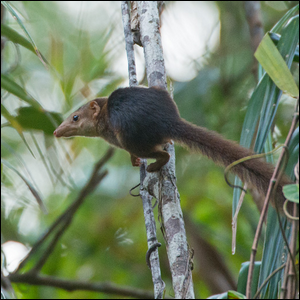 The humble little tree shrew loves chowing down on peppers and spicy plants too. Interestingly enough, however, the tree shrew doesn’t eat peppers for the thrill of it, but solely for the nutrition. In fact, they don’t seem to feel the burn at all. Researchers at the Kunming Institute of Zoology found that a single genetic mutation in tree shrews radically dampens their perception of capsaicin. They believe the shrews originally adapted in order to eat Piper boehmeriaefolium, a spicy plant with leaves that produce capsaicin—their ability to eat hot peppers with immunity is just a side effect of their original adaption. Image by Shreeram M V/Wikimedia.